Odessa, Ukraine – Nektony is proud to announce that, from today, Funter 4.0 is available for download from the Mac App Store. For users who prefer the convenience of getting apps through the App Store, this is the perfect time to download Funter – a freeware app addressed at those who are looking for the simplest way to show and find hidden files on Mac. Apps and web browsers on Mac create lots of unneeded files, which are hidden and might utilize significant disk space. Spotlight does not find such invisible and system files. But Funter allows you to find those hidden files, make them visible and easily operate them. All you need do to find hidden files is just type the name of the file in the finder field. Funter allows you to choose a folder for search, show all/hidden/unhidden files, forward to file location in Finder, preview files from Funter, or copy, move or delete files using the appropriate buttons. Funter makes it possible to switch file visibility with just one click. Funter is targeted at all Mac users who want to operate hidden files and folders. It makes it easy to find and clear user, system and browser caches. 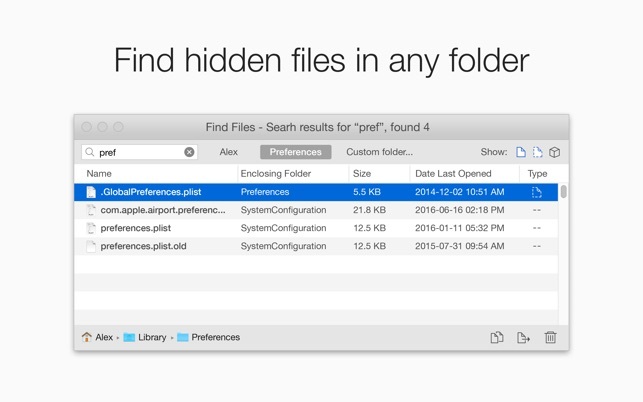 Funter implements an easy method of showing hidden files, and finding hidden and useless files in any location on Mac. Funter 4.0 is Free to download and available worldwide through the Mac App Store in the Utilities category. For more information please contact Alex Cormack.